I gave it four stars, not because I believe it is true, but because if one is interested in Cuba, one should read all sides. Cuba Betrayed is the ultimate work of propaganda. Fulgencio Batista explaining what happened in his terms as dictator, and afterwards, from his point of view. If you read it with an open mind, and also read other accounts, by Fidel Castro (which of course is also propaganda) and third party books, the differences and similarities of various authors’ view of all that occurred is interesting. 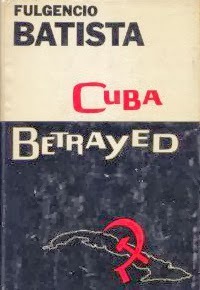 It starts with an interesting dedication, which itself casts blame for Cuba’s condition on everybody other than Batista, and even refers to his betrayers as Judas. The book covers his “Democratic Plans,” Castro’s attack on the Moncada, Propaganda (by others), the various presidents and leaders, “A Terrorist Plan,” “Crimes and Revolts,” Increase of Violence and Victims,” etc. Then it contains a number of historical reviews and Interviews and statements. Naturally, the book is a “poor me” analysis of why he was good, and how he and the people were betrayed by successors. Yet, it is historically accurate in many senses, provides details of prior presidencies, attacks, etc., and even accurately describes the feeling of the people of Cuba after they voted for Fidel Castro, and then, for the most part, believe they had made a mistake. The full table of contents, dedication, etc. appears here.